February 6, 2010 - The North American Aerospace Defense Command (NORAD) a joint organization of Canada and the United States will provide aerospace warning and aerospace control during the 2010 Vancouver Olympics. The 2010 Winter Olympics, officially known as the XXI Olympic Winter Games or the 21st Winter Olympics, will be held on February 12–28, 2010, in Vancouver, British Columbia, Canada, with some events held in the resort town of Whistler, British Columbia and in the Vancouver suburb of Richmond. Both the Olympic and Paralympic Games are being organized by the Vancouver Organizing Committee (VANOC). 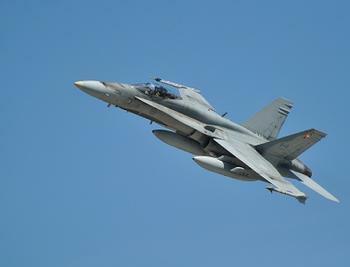 “It’s the sound of security.” This is how one reporter recently described the somewhat unusual presence of North American Aerospace Defense Command frontline CF-18 fighter jets in the Lower Mainland of British Columbia. The McDonnell Douglas CF-18 Hornet (official military designation CF-188) is a Canadian Forces aircraft, based on the American F/A-18 Hornet. Following the New Fighter Aircraft competition, the F/A-18 was selected as the winner in 1980 and a production order was awarded. The Canadian Forces began receiving the CF-18 in 1982. CF-18s have supported NORAD air sovereignty patrols and participated in combat during the Gulf War of 1991 and Kosovo and Bosnia in the late 1990s. “This is an operation we are well prepared to carry out,” said Lieutenant Colonel Rob “Waldo” Martin, NORAD Deputy Chief for Current Operations. “We have conducted extensive training with the RCMP’s Integrated Security Unit to make sure we carry out our duties in full support of the greater security operation for these Olympics.” Lieutenant Martin was quick to point out that NORAD’s presence is not meant to hinder the public’s enjoyment of the Olympics but rather to make sure no one can threaten the Games from the air. NORAD has been carrying out the missions of aerospace warning and aerospace control for Canada and the United States since 1958 and added maritime warning as a third mission in 2006. Since 2001, NORAD has responded to more than 3,300 possible threats to Canada and the United States. In addition, NORAD carries out extensive exercises year round to make certain its personnel are well trained for any situation or operation in which they could be involved. The 2010 Winter Olympics will be the third Olympics hosted by Canada, and the first by the province of British Columbia. Previously, Canada was home to the 1976 Summer Olympics in Montreal, Quebec and the 1988 Winter Olympics in Calgary, Alberta. The event will be officially opened by Governor General Michaëlle Jean.